With incredible sadness we share that Tab Wilkins, former Board President and active member of The Mountaineers, has passed away. We're shocked and saddened to share the news that Tab Wilkins, former Board President, Peak Society member, activity leader, and 19-year member, has passed away. He was skiing in the Blackcomb backcountry when he fell. Even though he was wearing proper safety equipment, he did not survive. He was 59 years old. Our community will be impacted greatly by this loss. Tab is survived by his wife Anita - his partner in life and adventure. They met in The Mountaineers, and were married in 2016. 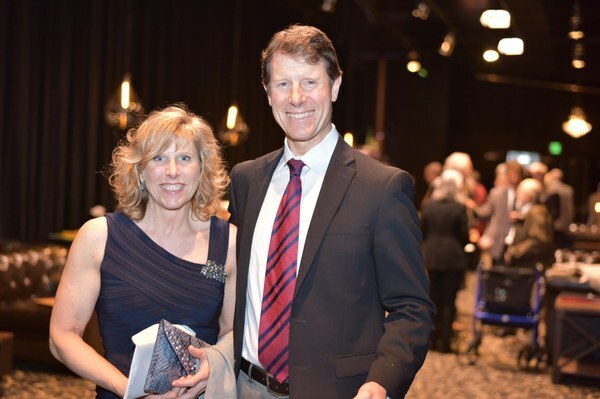 Tab and Anita at The Mountaineers Gala in 2018. Photo by HRV Media, LLC. Tab's contributions to the greater Seattle community, and The Mountaineers in particular, are immeasurable. Tab has been a crucial member of The Mountaineers for 19 years. 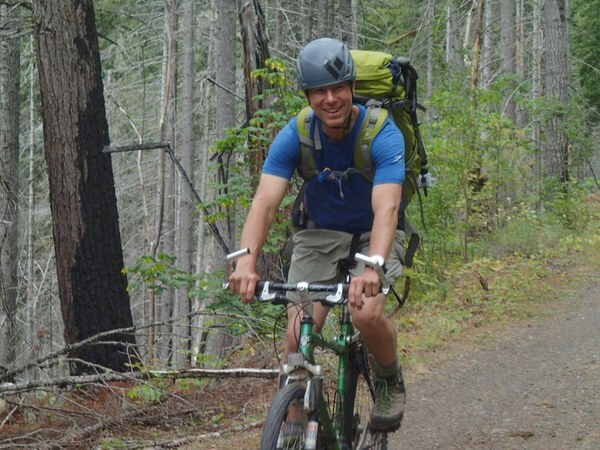 He served as our Board President from 2010–2012, was a founding member of the Peak Society, was a climb, backcountry ski, and scramble leader (and innovator of our Compressed Alpine Scrambling course), and donor for every fundraising appeal we have ever presented at The Mountaineers. "Tab was one of those remarkable people who positively impacted The Mountaineers community in every way," said Mountaineers CEO, Tom Vogl. "We will sorely miss his endless passion for the outdoors and his deep commitment to his family, friends, and our community." In 2015, Tab received the distinguished Mountaineers Service Award, given to the one volunteer in the entire organization who has contributed to the mission of The Mountaineers in a way that exceeds all expectations of our many exceptional volunteers each year. He was also a board member for the Northwest Avalanche Center, and was recently appointed President & Center Director for Impact Washington, with which he's been associated for the last 17 years. "I’m so deeply saddened to learn the news of Tab’s passing," said Scott Schell, NWAC's executive director. "He was the rare individual we hope to meet along the way that leaves a lifelong impression - that deep kind of impact often not truly understood until later. His four years of service on the NWAC Board was no different. His dedication and leadership have ushered such positive change for NWAC and the entire PNW backcountry community for years to come." Tab was also a participant in Turns All Year, a group of folks who strive to ski at least once a month for as many months in a row as they can. At the time of the accident, Tab had reached month 40 of Turns All Year. Tab celebrating month 35 of Turns All Year on Mt. Rainier in October 2018. Photo by Rick Meade. “I was new to Tacoma and happened to drive by the Tacoma Branch Clubhouse one day,” Tab said in a 2015 interview for Mountaineer magazine, when asked how he came to be involved. 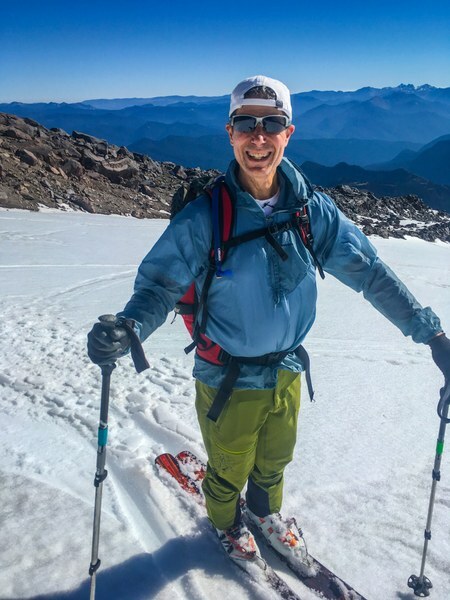 “I liked outdoor activities and thought it would be a good opportunity to meet people who liked to do the same thing.” He started out hiking with the Tacoma Mountaineers, became a hike leader, and led hikes for eight years until his work took him to Seattle where he continued to take courses with the Seattle Branch. Tab enjoying a multi-sport trip. Photo by Royce Poetter. Ask anyone, and they'll tell you Tab lived the ethos of The Mountaineers: to adventure with purpose. He spent most of his free time outdoors - skiing, hiking, scrambling, biking, or some combination of 'multi-sport'. He modeled the leadership he wished to see as a leader at all levels. After his term as president he continued to serve The Mountaineers, leading trips for adults as well as our teen program, and providing key leadership for a number of strategic projects. Endlessly patient, and always leading with a compassionate smile, Tab was well-loved by our community and admired by many. "I led a Sloan Peak trip a few years ago, under a full moon, great weather and people - the combination made it an unforgettable experience (plus I had done Glacier [Peak] a few weeks prior and was looking at Sloan with anticipation). We had a leisurely start in the morning (so 5am), and we weren't quite sure the climb would go as it was a bit early in the season, but it went fine and amazingly enough we quickly summited. After wonderful pics we climbed down, and on the trip back we enjoyed a winding traverse of the various streams running full. It was quite a set of stepping stones that I guess are dry later in the year." Since 2014, Tab has served as the primary or assistant leader on 72 trips to get others outside to hike, scramble, climb, and ski. He's helped hundreds, if not thousands, of fellow Mountaineers test skills and find happiness in the outdoors. "As is the case for so many in our community, it will take time to absorb Tab Wilkins' passing," said Lorna Corrigan, current Mountaineers board President. "It was Tab who, as president-elect, originally invited me to serve as the secretary of the board of The Mountaineers. His dedication to the out-of-doors and specifically to the members of The Mountaineers, combined with his business experience, made him an exemplary board President. He set a high bar for all of us who serve the organization, whether as board members, volunteers, or staff. Our loss is enormous, and we will work through our grief to remember and honor Tab as he would wish: through time spent together as Mountaineers." Our deepest sympathies go to everyone impacted by the loss of Tab, especially his wife Anita and her children, Tab's family and friends, his adventure friends, and all the Mountaineers who knew him. We are truly shaken by this loss. Tab was a close friend and colleague to many of us, and we will be offering support to those impacted as our community processes the sudden loss of a beloved Mountaineer and friend. A public memorial service and reception for Tab will be held on Sunday, May 19, 2019 from 1pm-4pm in our Mountaineers Program Center (Goodman Auditorium). More details to follow. I am devastated by this news. One thing not mentioned in Tab's many volunteer positions with the Mountaineers was his two year stint as VP of Properties. Directly after serving as Board President for two years, he decided to learn more about the properties, and to support them in any way that he could. As VP of Properties, he set out to learn all he could about the Mountaineers Players and Kitsap Forest Theater, and was an invaluable support during several crisis and major projects. He was a personal mentor to me, and his unfailing support during some difficult times will never be forgotten. He raised awareness of the properties to the Mountaineers Board during his stint, and gave hope to those of us who sometimes felt "on the fringe" that we were not a forgotten entity of The Mountaineers. He was such a shining light and I can't believe he is gone. I am so sorry for his wife and family. The Mountaineers have lost so much. I am so thankful for all he gave to me and the Mountaineers Players/Kitsap Forest Theater. This is terrible news as Tab was a wonderful person, friend, and Mountaineer. As an impressionable basic student in 2014, I went on that Sloan Peak Corkscrew Route climb with Tab Wilkins. It was incredible -- route finding and multiple log crossings through a marsh, camping and just hanging out with everyone on the trip watching the sun set on one side as the full moon rise on the other, and the next day doing snow and a corkscrew rock scramble. Tab was so competent in route finding and creating an atmosphere of a group endeavor and just being nice. Thank you, Tab. I interacted with Tab at monthly "Meet the Mountaineers" meeting years ago in which I represented the Seattle Backpacking Committee, and Tab was the master of ceremonies. His warmth, joy, and passion for the Club stuck with me. He is missed.